The government has today (15 December 2017) published independent research into the future capability and capacity of the UK’s steel industry. Through the ambitious, modern Industrial Strategy, the government is determined to set out a long-term plan for the UK steel sector. "Through our modern Industrial Strategy, the government has been clear that we will do everything we can to support our steel industry. The capability and capacity report identifies high value opportunities for the sector worth nearly £4 billion." "The steel pipeline shows our commitment to using UK steel for infrastructure projects and we want UK companies big and small to be strong competitors for government contracts. The study has identified real opportunities in new and existing markets that could be worth as much as £3.8 billion a year by 2030. The report also recognises the barriers that the sector is working to overcome. The government has already made significant progress to tackle global over-capacity in the steel market. In November, Business Secretary Greg Clark attended the G20 Global Forum on Steel Excess Capacity in Berlin, which unanimously agreed important policy principles and recommendations towards challenging over-capacity. The G20 Global Forum now has a mandate to ensure that those countries that offer unfair subsidies are properly addressed. "Community welcomes the ‘Future Capacities and Capabilities’ report. This will help us all better understand the opportunities and challenges facing the UK steel industry. "We also welcome the new procurement pipeline, which will assist steel companies in planning and investing for the future. "The UK steel industry has enormous potential, and we urge government and steel companies to continue working with the unions to secure a sustainable future for UK steelmaking. "Crucial to this future will be the successful conclusion of a ‘sector deal’ for our industry, which will unlock investment and safeguard thousands of jobs across the UK." Last year government published a pipeline of steel procurement and today an updated, extended version has been released. 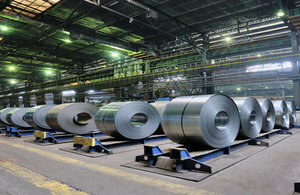 The publication honours a pledge government made to annually publish steel procurement data. This information shows how government plans to use 3 million tonnes of UK steel in infrastructure projects in the next 5 years. The steel will be used across the UK in projects such as High Speed 2 (HS2) and the construction of Hinkley Point C. This pipeline will allow steel companies to better plan for the long term, helping large and small manufacturers to compete effectively for government contracts. This steel-specific pipeline complements the 2017 National Infrastructure and Construction Pipeline, which sets out over £600 billion worth of planned private and public investment. From roads to rail, defence to nuclear, the pipeline shows that central government is using enough steel to build the equivalent of 173 Wembley stadiums – or 3 million tonnes worth of steel across over 50 separate projects over the next 5 years.